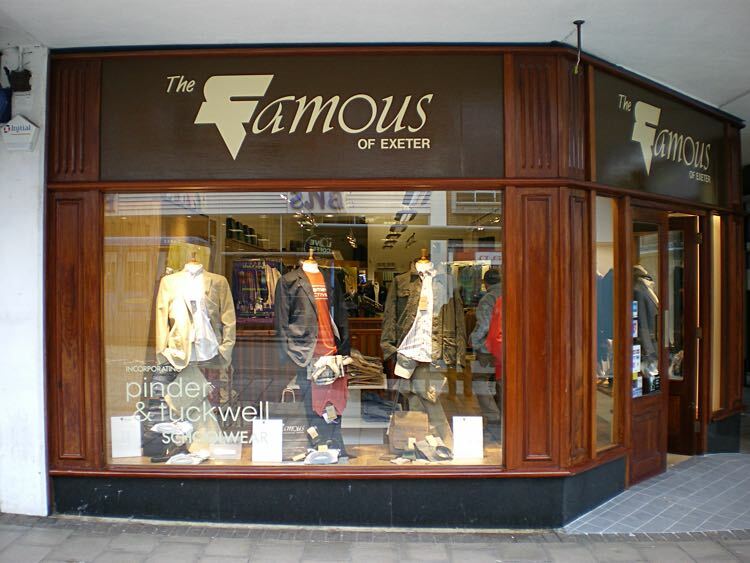 One of the longest established menswear stores in Exeter lost its traditional name in 2008. 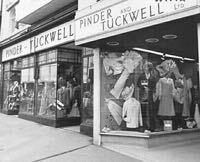 The store now known as The Famous was for 130 years known as Pinder and Tuckwell, a name associated with personal service and quality clothing. 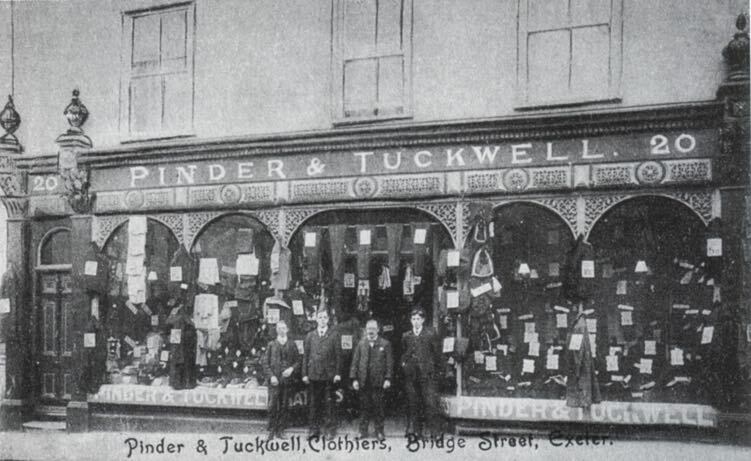 The roots of Pinder and Tuckwell are said go back to 1824, when a Mr Richard R Pinder, a local tailor, opened his clothing emporium at 191 High Street, in premises that were next to another old Exeter firm, Garton and King. However, the earliest entry in an Exeter Trade Directory is for 1850 which lists Richard Pinder and Co. The business was registered as a company and was one of the first in the city to incorporate heads of department on the board of directors. "Several important results have followed from the Great Exhibition of the Works of all Nations. Taste, skills and ingenuity have been awakened to the utmost, in all concerned with the manufacturing arts, and at the same time economy has not been lost sight of. 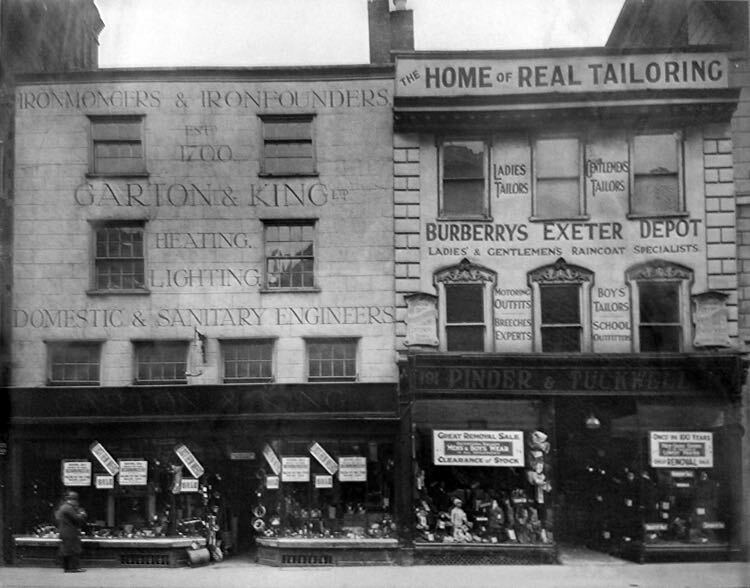 PINDER and CO, the extensive TAILORS AND OUTFITTERS, of Exeter, have not been indifferent to the great movement, and they have provided a most extensive STOCK of very variety of Style and Quality, at prices altogether, unexampled for moderation. All who are disposed to go to London well, substantially, or fashionably clad, should purchase at their Old Established Concern, and they will have a good deal more cash left in their pockets for the sights of London, than if they bought elsewhere, for they will assuredly." Sometimes a business can appear to be too successful, attracting those who wish to make easy money. 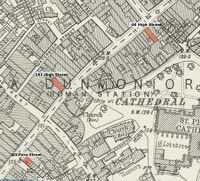 In January 1855, Thomas Bailey Kinsman went to trial for 'obtaining two coats from Mr Pinder, High Street' for which, along with another offence, he was given 3 months. From 1873 Mr Joshua Carboy Tuckwell joined the firm and it became Pinder and Tuckwell. Early adverts from this period enigmatically proclaim that the company is expert as 'outfitters and shipping agents' for 'intending settlers' to the United States, Canada, Australia and New Zealand; they would continue as shipping agents for several more years for the Cunard, Inman, White Star, Orient and Guion Lines. A year later and they devised an innovative advert in very small plain text, in a standard sized box, thus drawing the eye to the white space on the page amongst the clutter of other adverts. This was clearly a partnership that worked. In December 1877 they announce that ladies riding habits and jackets were available from the shop. In September 1892, the employees presented Mr Tuckwell with a handsome walking stick on the occasion of his 50th birthday. 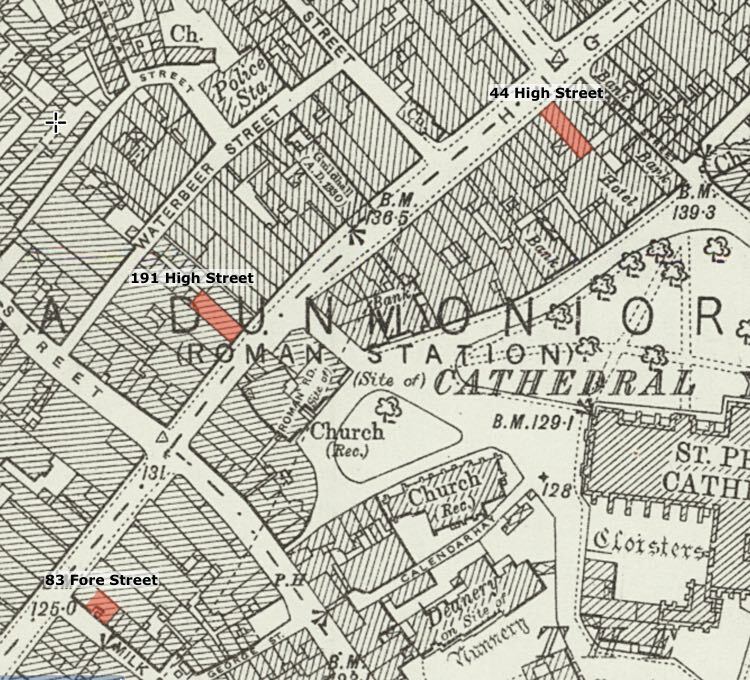 An outfitting department was opened to supplement the hosiers and hatters, and business flourished, while a second shop at 20 New Bridge Street, on the corner of Bonhay Road, was open by 1893. The next saw the interior of the shop extensively remodelled and modernised. In 1895 an advert appeared claiming that the firm had been engaged for the previous 50 years as 'boy's clothiers', supplying Eton, Harrow, Rugby, Cambridge, Marlborough and Cheltenham amongst the schools for which they held clothing. The shop was an exclusive tailor's and a gentleman could have a morning suit made to measure for 32 shillings (£1.60), a not inconsiderable sum for the times. Paris silk hats were sold for 3s 6d (17p), doeskin trousers cost 8 shillings a pair (40p), light overcoats were 21 shillings (£1.05) and a customer requiring a shooting coat to wear at a weekend in the country would have to pay 14 shillings and 6 pence (72p). After the First World War times were changing, and the New Bridge Street premises were closed. Country houses were becoming too expensive to maintain, and shooting parties and other country sports were no longer the centre of fashionable entertainment. It was in 1927, that Mr W H Pinder, the last of the line, died, and in 1933, Alfred Wilson Tuckwell, the last of the Tuckwell's to be involved in the business retired. It was now that the policy of involving the staff in the running of the business paid off, and seven members of the workforce took over, still under the name, Pinder and Tuckwell. One of the first directors was Edwin James Scoble, who had been with the company at the High Street from March, 1899. He recalled that in the early days "We started at 8am and worked until 7pm. Early closing day was Saturday, at 5pm. In the evenings we often cycled to Dawlish to bathe. We had to leave a lamp on the rocks to see where our clothes were." Soon after the staff takeover, the company became a private limited business and Mr Scoble, who was the first company secretary, retired in 1957 after 58 years. 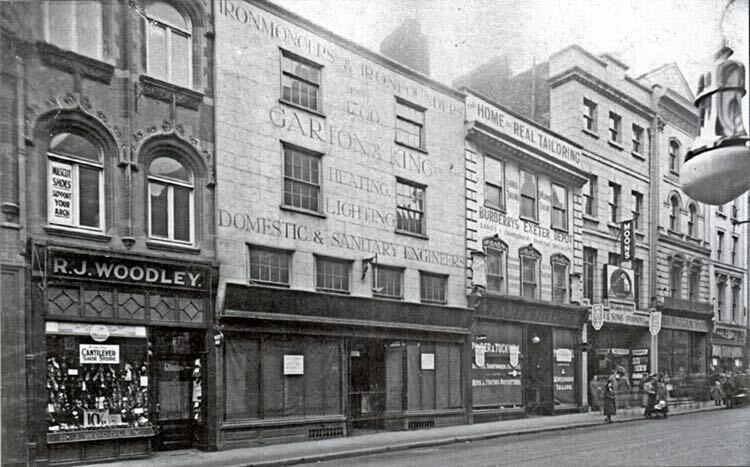 Both Garton and King and Pinder and Tuckwell were made an offer from Woolworths to vacate their premises in 1933. Woolworths combined the two shops, rebuilt the front and opened their new store in 1934. Now, we know the premises as the home of McDonalds and HMV. Pinder and Tuckwell moved to 43/44 High Street, now Costa Coffee, where they started to specialise in providing uniforms and clothing for the local schools. This and their in-house tailoring gave the firm a new lease of life with many orders from the US, Canada and Australia. Edwin James Scoble's son John Edwin Scoble was also an employee of the company and was also chairman of the board and company secretary, leaving in 1963. Even at this time, they were still using a vacuum tube system for transporting invoices, receipts and cash from the tills to the office and back. Made by Lampson and Paragon, change was tendered from the third floor office, requiring no cash to be kept in the tills. Time rolled by and in February 1979 they moved from 43/44 High Street to 83 Fore Street. It was in 1988 that Pinder and Tuckwell lost its proud independent status, when it was bought by the Cheltenham company known as The Famous of Cheltenham, itself, a business that could be traced back 120 years, in men's and school outfitting. Although there had not been a Mr Pinder nor a Mr Tuckwell in the company for 60 years, it was their ethos of quality and service that was attractive to The Famous. 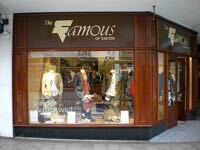 In the middle 2000s, The Famous closed the shop in the High Street, and opened their own branded store in Fore Street. Pinder and Tuckwell continued in a basement selling school clothing. The combination did not thrive, and in March 2011, it closed. John Austin, a director had been with the company for nearly 50 years. Pinder and Tuckwell were to continue supplying several local schools with clothing and uniforms directly. An interesting sweep of shops in the High Street. Pinder and Tuckwell are third from the left. Pinder and Tuckwell on the right at 191 High Street. The shop at 43-44 High Street. The Famous, with Pinder and Tuckwell engraved on the window at 83 Fore Street. The shop at 20 Bridge Street.